Alcides is the scientific name for the auks, a family of penguin-like sea birds that are good at swimming and diving, but look rather silly while walking. 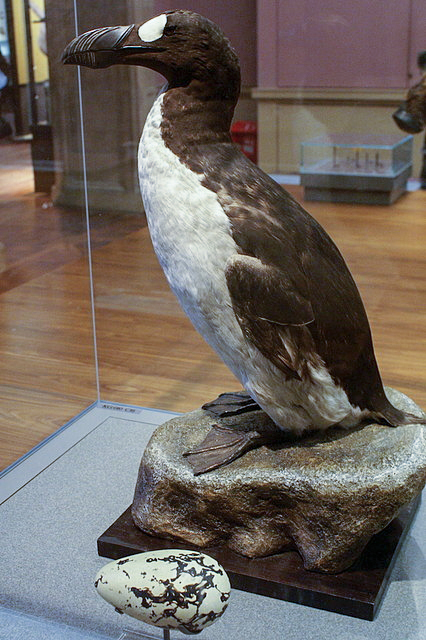 The Great Auk was the only flightless member of this family, which lived in the waters of the North Atlantic. It bred on cold, rocky, isolated oceanic islands, but only ones with a plentiful food supply, a rare combination in nature that provided only a few perfect breeding sites for the Auks. Outside of breeding, it foraged for food at sea, and was an excellent hunter in the water. In its heyday it ranged as far south as northern Spain and Italy, and also around the coast of Canada, Greenland, Iceland, the Faroe Islands, Norway, Ireland, and Great Britain. The Great Auk was the largest member of its family, which is probably how it became flightless. What it lost in flying skills it made up for in swimming; its ability to dive and maneuver underwater helped it hunt fish and crustaceans, and helped it to evade capture by boat. In the sea, they were elegant and efficient; on land they were ungainly and slow, and that made them vulnerable. Only known illustration of a Great Auk drawn from life, Ole Worm’s pet received from the Faroe Islands, which was included in his book Museum Wormianum. What we know about the life of the Great Auk comes mostly from the casual diaries, records, and letters of mariners. Pairs of Great Auks mated for life. They shared egg-incubation and child-rearing duties, nesting in dense, social colonies and laying only one egg a season out on bare rock. A young Auk left the nest after two or three weeks, although the parents continued to care for it. The auk’s calls may have included a low croaking sound and a hoarse scream. A captive auk was observed making a gurgling noise when anxious. There are no existing recordings of the birds. Native Americans hunted the bird, as did Scandinavian settlers in Iceland. European colonies of auks were hunted extensively for their down, which was in great demand, and their colonies in Europe had almost disappeared by the mid-sixteenth century. The realization that the auk was disappearing prompted some of the earliest environmental laws, but they were not enough to have an effect. The arrival of European colonizers in the Americas brought on wholesale slaughter of the birds. Sailors traveling between Newfoundland and Europe used the auk as a convenient source of food and as fishing bait. Summer (standing) and winter (swimming) plumage. By John Gerrard Keulemans. Like other flightless birds living in isolation, great auks were docile and awkward on land. They could not fly and could only waddle at about the pace of a human. They didn’t show fear when approached by people and were therefore easily caught on land. Sailors raided the nesting colonies they found and took birds and their eggs by the thousands to eat, render for fuel, or salt for later consumption. There are numerous accounts of whole communities of birds being driven onto boats and driven into pens to be killed by the hundreds. Its growing rarity then intensified interest from European museums and private collectors in obtaining skins and eggs of the bird, reducing their numbers even further. The last known pair of breeding Auks on earth were killed by collectors on a remote outcropping off the coast of Iceland. The collectors rowed out through the harsh North Atlantic at night, and landed on the remote rock in the morning. The population of auks there had been reduced by this point to one last pair of birds and an egg. The birds tried to run away but were too slow; the collectors caught them and strangled them. In the hullabaloo the egg was cracked and was left behind. The innards of these two birds were preserved and are held in the Museum of Zoology in Copenhagen, Denmark; no one knows where the skins went to. Following their extinction, the value of auk skins increased dramatically in value, and auctions of bird skins and eggs attracted lots of attention in Victorian England. The price of eggs sometimes reached up to 11 times the amount earned by a skilled worker in a year. 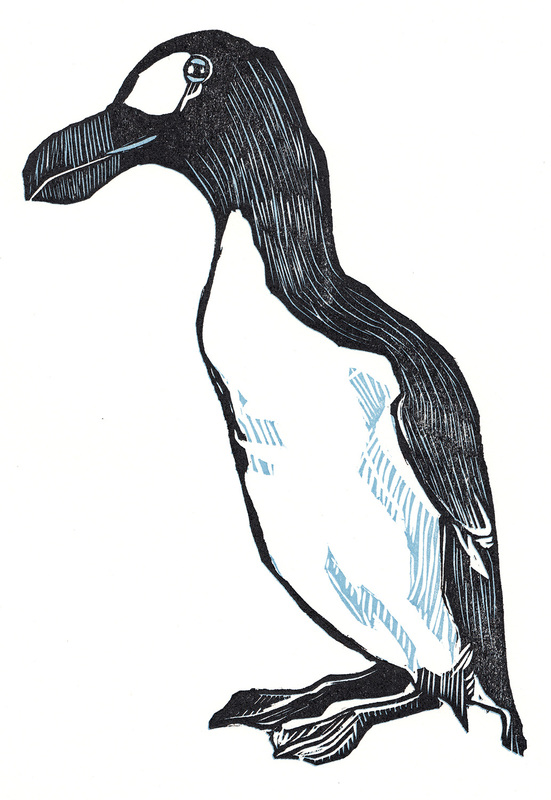 The Great Auk is one of the more frequently referenced extinct birds, and has been often portrayed in children’s literature. Who is the artist and what is the title of the first image? So sad that this bird was brought to extinction by human greed. It would have been even more amazing if it were alive and well.